Oh, one more thing before we go, here is a Happy New Year’s makana to all you readers out there! 2012. We’ll be going on a week vacation and be back next Wednesday! Hope 2012 brings you the best of things!!! Some people just shouldn’t play with firecrackers! 1939. Just as people pop firecrackers on all important days, it is also played with by children every year. On this past Christmas night in Honolulu, just as fireworks are set off yearly, so too did a young child named Valentine Souza. He shoved a firecracker in the metal, and lit it; the fuse started to burn and when it reached the powder, the firecracker exploded, and because of the strength of the blast of that firecracker, the metal he was holding, and because the metal shattered, some of his fingers holding on to the metal shell were severed. The fingers that were severed were from his left hand: the thumb and two others; those fingers will be short at the tips until the end of his days. He was taken to the emergency room and there was examined by Dr. Katsuki. Ka Hoku o Hawaii, Vol. XXXIII, No. 37, Aoao 3. Ianuari 11, 1939. 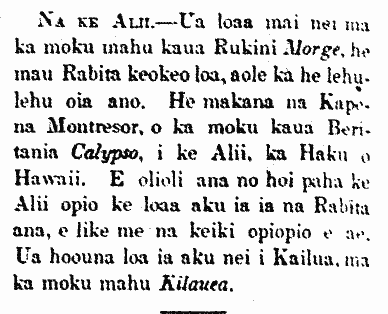 Ka Puuhonua o na Hawaii, Buke IV, Helu 4, Aoao 4. Ianuari 26, 1917. Don’t leave the kitchen while cooking—still good advice a hundred and fifty years later, 1861. At Lihue, Kauai, a house was consumed by fire. This is the reason for that house burning down: A kitchen fire of one of the children of Solomon’s school, who was cooking something for himself. He lit the fire and went away to another house, and was there for perhaps half an hour, and the house was immediately destroyed. The contents of the house lost to the fire was some barrels of Salmon, and some other valuables. This house that was destroyed by fire belonged to Mr. Rice. P. R. Manoa. 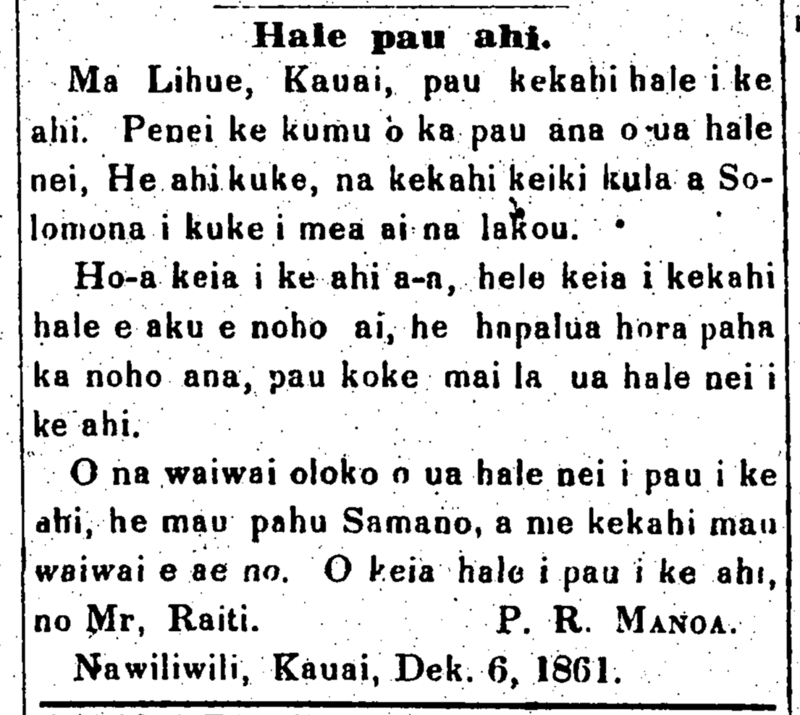 Nawiliwili, Kauai, Dec. 6, 1861. 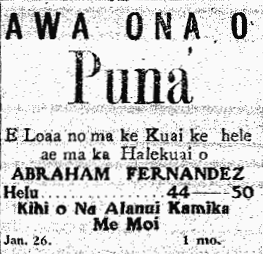 Ka Hae Hawaii, Buke 6, Helu 39, Aoao 156. Dekemaba 25, 1861. Rabbits for the young prince, 1861. For the Alii.—Aboard the Russian warship, Morge, there were pure white Rabbits which are probably rare. They are a gift from Captain Montresor of the British warship Calypso to the Alii, Ka Haku o Hawaii. They young chief will most certainly be thrilled when receiving his Rabbits, just like other young children. It was sent all the way to Kailua by the steamboat Kilauea. Ka Nupepa Kuokoa, Buke I, Helu 5, Aoao 2. Dekemaba 16, 1861. 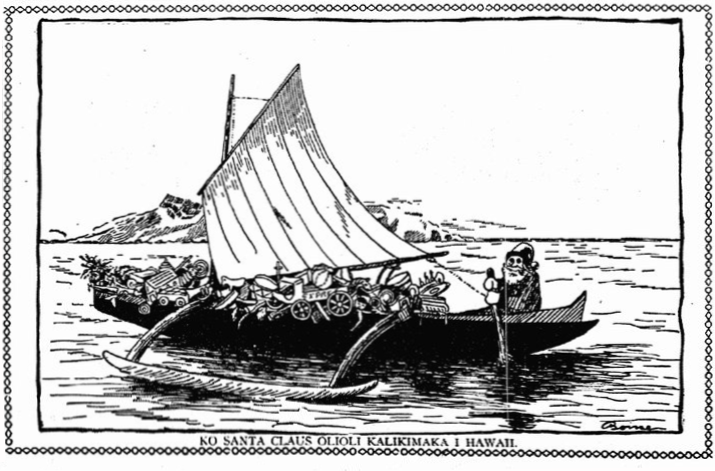 Here comes Santa in a red canoe, 1905. SANTA CLAUS’ CHRISTMAS JOY IN HAWAII. He malu ma ka honua, a he aloha no i kanaka. Ka Nupepa Kuokoa, Buke XLIII, Helu 52, Aoao 4. Dekemaba 29, 1905.